Devices running Ivanti agents automatically appear in the All devices group when they are scanned into the core database by the inventory scanner. Typically, this scan takes place for the first time during a device's initial agent configuration. Once a device is scanned and its inventory report has been sent to the core database, it is considered to be a managed device. In other words, it can now be managed by that core server. For more information on setting up devices, see Configuring device agents. 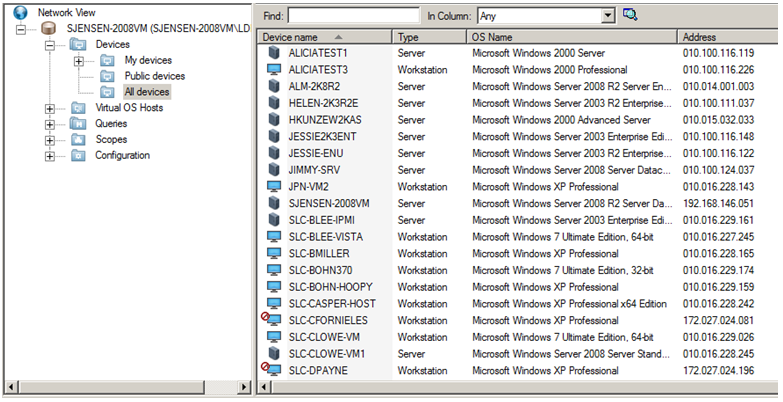 Because the All devices group is populated automatically via an inventory scan, you may never need to manually discover devices. However, to discover devices not already in the core database, you can scan the network for devices with the unmanaged device discovery tool. For more information, see Viewing a summary inventory. When connected to a particular core server, the administrator can see every device managed by that core server. Other users are restricted and can only see the devices that reside within their assigned scope (a scope is based on either a database query or a directory location). For more information, see Role-based administration overview.